Handlebars are perhaps the most difficult challenge any motorcycle owner faces. Maybe the rider wants a completely different style or simply to move them an inch or two forward or backward. While this may sound like a simple process, you need accurate dimensions of your existing handlebars for the perfect fit. If you don’t have the correct dimensions, then you need to know how to measure handlebars. Each manufacturer measures handlebars differently, making an across the board comparison difficult, if not impossible. Regardless of the reason for changing out the handlebars, if you get the dimensions wrong, it gets frustrating. 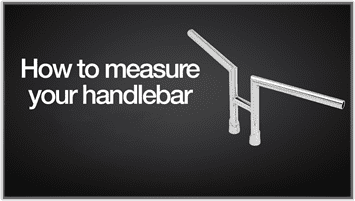 Our step-by-step measuring instructions help you find the exact handlebar size you need. One thing to remember is that very few handlebar companies use the same manufacturing bending processes when making the bars. Usually, the bar diameter just on the outside of the clamps differs from the clamp diameter itself. Fortunately, there aren’t that many sizes, making getting the right bar for your bike, much easier. Determining the dimensions for the new handlebars is fairly simple, but find a buddy to help. All you need is a broomstick, string with a washer or nut tied on end, and a tape measure. You can easily take the measurements with the stock bars on or with them off the cycle. In addition to diameter, handlebars also get their measurements according to the rise/height, pullback, and width of the bar. In this step, we’ll help you measure your handlebar width. Start by sitting on the bike as if you’re going for a ride. Grasp the broomstick with both hands as if the stick were an actual handlebar. Stretch out your arms until you have the position you feel comfortable with for your new handlebars. Have your helper measure the distance from the outside of one pinky to the outside of the other pinky. This measurement gives you the overall, comfortable width for your new handlebars. Next, tie the string to the broomstick (in the middle of your overall grip) so that it hangs down like a plumb bob. You can then determine the pullback by measuring from the center of the handlebar to the string. Tie the string with the washer to the broomstick, in the middle of your overall grip. You want the string and washer to hang from the broomstick. Measure the rise and height from the handlebar center to the broomstick center. If you don’t have the broomstick resting above the handlebar, you might find using a straight edge easier. A straight edge helps give a more accurate measurement by making a right angle from handlebar to string. Have your helper mark the string where the straight edge and string meet. Have them measure the distance between the string’s mark to the center of the broomstick to get the height. After you have the basic measurements, it’s time to start researching handlebar styles that will fit what you need. For shorter, taller, or pullback risers, factor in the height/pullback measurements when choosing a handlebar. Keep in mind that some manufacturers use different terms, like upsweep or back sweep. Besides different terminology, manufacturers may measure the bar differently, taking measurements from bottom to top rather than from the center. Or you may need additional measurements like end rise knurl width, or center width. In these situations, determine their measurement point and factor them into yours or redo your measurements to match theirs. Bar Diameter: Some companies refer to the outside bar measurement as thick while others refer to it as fat. This measurement is OD/thickness. Most manufacturers sell handlebars in 1- ¼” or 1- ½” thick measurement. These bars have more thickness overall except in the clamp and hand control area. In these areas the handlebars narrow to a 1” thickness. This smaller thickness allows you to fit the bars with riser and stock controls. Bar-end and Overall Width: The overall measurement that runs from one bar-end to the other. Center Width: This measurement runs the distance of the flat section in the handlebar middle before the bars bend, rise, or pullback. Knurled: This manufacturing method adds texture or roughness to the handlebars, giving a better bite to the risers or mounts. Knurled usually involves two 1” grooves or line sections machined into the handlebar clamping area. You may also find some manufacturers use a crosshatch pattern. Knurl Width or Clamp Area: This area refers the distance to knurl marks or where risers clamp on the bar. The marks have an outside-to-outside, center-to-center, or the distance measurement between the knurl marks. Height or Rise Height: The rise height is the distance measurement starting at the midpoint of the handlebar’s flat The measurement then runs to the center point at the highest point of the motorcycle handlebar. Pullback: This is the distance the bar ends or pulls back, or away from the centerline through the bar middle. Sweep – Bar End Sweep – Wrist Angle: This term refers to the angle at which the end bar sits about the center of the bar. Also refers to hand placement angle. Drilled: Involves the drilling of small holes into the bar end’s underside or where your hand controls sit. The hand controls sit in the middle of the clamping area, which allows for running the switch wires internally. Swedged or Dimpled: The underside of the bar ends get pressed into the handlebar, creating a small channel or indention. This channel lets you run the switch wires externally without the cables getting pinched by the control housing. Some manufacturers drill and dimple their handlebars, so you get both options. When it comes to ordering motorcycle handlebars, your main requirement is comfort. Avoiding fatigue while you’re riding the road is always the first consideration for any rider. Taking personal measurements following these instructions is the easiest way of finding a comfortable handlebar. Armed with this information, you should have a good understanding of measuring and identifying the best handlebars for you.